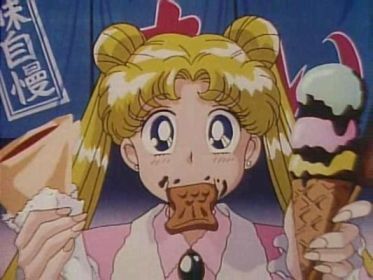 Usagi doing what she does best… eating! Though not quite as well known as his Sailor Moon R counterpart Kunihiko Ikuhara, Sailor Moon S movie director Hiroki Shibata has an impressive number of animated tv series and movie credits to his name.1 He was also heavily involved in the direction of the Sailor Moon S and Sailor Stars anime seasons, so there really isn’t much room to criticize him for “not getting” the series. That being said, many fans (rightfully) point out that this movie has a different feel to it than the rest, and not all of that can be explained away by the fact that Ms. Takeuchi was heavily involved in the production. In fact, the places where the movie is often criticized as “going wrong” are the times when it deviates from Ms. Takeuchi’s story. In the interest of fairness, I think we should give Director Shibata a chance to tell his side of the story, and provide his insights behind some of the movie’s pivotal scenes. 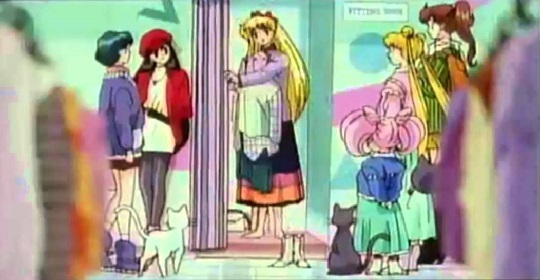 Director Shibata comments that his goal for the movie’s opening scene was to show Usagi and her friends living out their normal, day-to-day lives. Taking into consideration that the majority of the audience were likely 3-10 year old girls, he opted to add a lot of comedy to the opening scenes to draw in the viewers. As an interesting aside, he also mentions that he had a daughter in first grade (roughly 6-7 years old) at the time, and she loved this part of the movie. As for the location where this takes place, he remarks that it’s an amalgamation of Shinjuku, Shibuya, and Harajuku. Personally, judging by all the stores in the background, I’d argue it’s pretty much Shinjuku… but that’s another article for another time. The scene surrounding Luna and Kakeru’s first meeting, where she collapses in the street and is nearly hit by a car, ties into a similar scene later in the movie when Kakeru himself collapses. Perhaps I’m just dense — I probably am — but I never actually noticed that. Neat! Back at Kakeru’s observatory/home, Director Shibata asked the sound effect artists to add a faint sound of waves to this scene, as he felt that that the sound perfectly captured the loneliness and quietness of living in an observatory. Worried that the audience might be getting bored of watching the story of some new guy and Himeko unfold, Director Shibata added in the scene of Usagi and friends worried about Luna not coming back in order to keep the audience engaged. He also threw in a scene of Rei and Usagi exaggeratedly arguing with each other — an anime favorite — to add a comedic tone and keep the story light. In order to convey a sense of ice, snow, and cold for Princess Snow Kaguya and her Snow Dancers, Director Shibata notes that they used blue carbon when transferring over their outlines onto the cels for coloring. Incidentally, usually black carbon is used (hence the black character outlines you usually see). Director Shibata mentions here that he thinks of the transformation animation and music as similar to a child’s beloved picture book: no matter how many times they see it, it still elicits feelings of fun and excitement, and the animation never gets old. I would be inclined to agree… until he notes that this was part of his reasoning behind why he used the transformations and attacks basically as-is from the tv series, without much in the way of any extras for the movie. 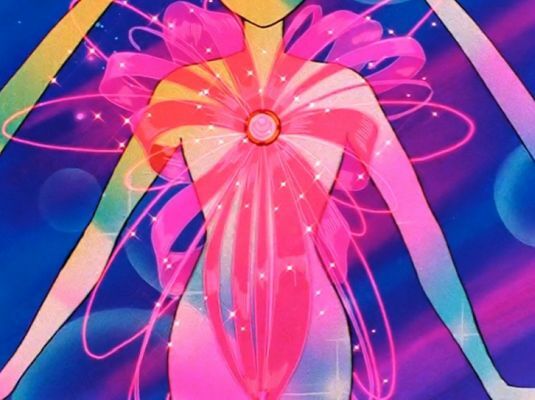 All that he really changed was increasing the tempo of the Sailor Team’s transformations and using the long version of Sailor ChibiMoon’s transformation. Read also: Why Does Fiore Look So Much Like Ail and An? I can see where he’s coming from in terms of not wasting money on something the viewers would already be satisfied with anyway, but I do think I like Director Ikuhara’s all-out approach in Sailor Moon R better. The Santa Mask (Tuxedo Claus?) scene was apparently added in at Producer Iriya Azuma’s direction. Since most of the audience would be watching the movie in theaters on or near its December 1995 release, he wanted to have a scene that had something to do with Christmas or New Years. And thus Tuxedo Claus was born. Other ideas pitched out by the production staff were to have Tuxedo Mask float down holding a kite — a popular Japanese new years activity2 — with skis attached to his feet, or to show up playing hanetsuki,3 a traditional Japanese game akin to badminton. I don’t know about you, but I think I’m happy to stick with Santa Mask. Tuxedo Claus is comin’ to town~! Unfortunately, this is running a bit long and we’ve still got quite a bit of a ways to go to get through all of the director’s commentary (note 9 of 22),4 so I think I’ll have to cut it off here for now and save the rest for next time. I really do love getting this extra insights behind the movies, though, since they give me further incentive to watch the movies again and see if I pick up anything new. As I mentioned above, Sailor Moon R happens to be my favorite of all the movies, but I’m curious to know what everyone else thinks. Even among me and my siblings, we’re all across the board on this subject, so I’d be interested in hearing how other people feel about the movies! Read on for Part 2! ← Why Did the Amazoness Quartet Serve as Chibi Moon’s Guardians? I guess I feel a little better about the comedic moments now, since the whole love triangle side of the plot is maybe a bit mature for kids. And I actually do love that opening sequence with everyone just shopping together–it’s very charming! And Tuxedo Santa is iconic. 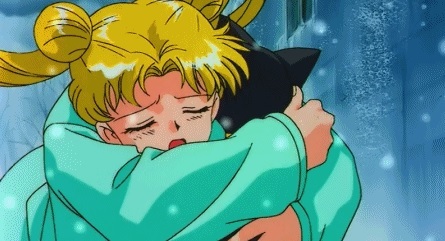 I really could have done without the Rei/Usagi fight, though. It felt so out of place and made it seem like they weren’t really concerned about Luna. I do wish that he’d added something to the attacks and transformations too. It’s one of the things that sets the other two movies apart from the series and makes them feel special rather than like an extended episode. Kids love repetition, but they like special versions of their favorite things too. I will also say, since I just got to see the North American theatrical screening, the Snow Dancers were amazing on the big screen with the blue outlines. I definitely noticed it and thought it was a brilliant artistic choice. I really loved this movie. Like you, I prefered the Sailor Moon R movie (I writed a lot of articles about it and i love yours). But there’s a lot of fans that said to me this is the best Sailor Moon movie. I can’t wait to read the other articoles about it. Posted 2018-08-02 at 3:26 am by A.J. For me, this movie’s flaw lies in the inconsistent pacing of the big confrontation at the end with the senshi and snow kaguya. Personally, the S movie is my favorite. Not only because it’s the only one that’s actually based on the manga, but for a number of personal reasons as well. I love ice and snow, Christmas, The Snow Queen, and all things cold. 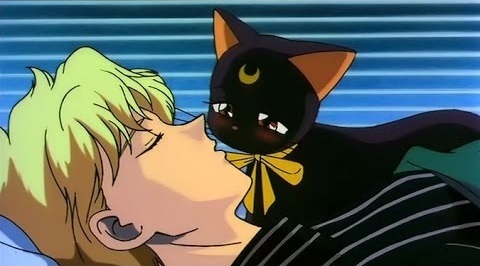 It was also the first piece of Sailor Moon lore I ever saw in Japanese so it served as my introduction to Sailor Neptune (my favorite), Uranus, Pluto, Chibi Moon, Super Sailor Moon and all the new attacks and transformations that accompany them. It was also my first time hearing the Japanese voice cast or learning their Japanese names. It will always hold a special place in my heart for that. All that having been said, I will say that I have always preferred the more cinematic approach the R movie took to the attack sequences, and action scenes in general. It’s the one thing I wish this movie had done differently. I’ve always been slightly salty that the movie I like best didn’t benefit from that approach. Ikuhara’s storytelling is so artistic, and the more I rewatch the R movie the more I recognize the ideas that would eventually become Utena. Great article, and I can’t wait for the rest of your commentary on this movie. I agree that the R movie is clearly the best of the three. Good story, good pacing, good action… memorable scenes and a strong ending, it’s just well done from start to finish. The S movie is very enjoyable, but IMO it stands out from the series just as much as the “summer break” episodes from the first two seasons, the tone is very different. It’s essentially a story about Luna and Kakeru, and it just happens to take place in the Sailor Moon universe and feature good guys fighting bad guys in the end. The villain isn’t so memorable and the story isn’t about the heroes, it’s about Kakeru. 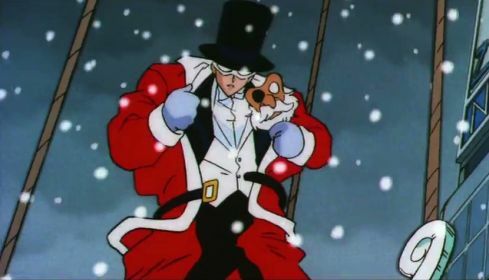 It’s just not quite as good as the perfectly done first movie, though I love the comedic moments and especially the unforgettable Tuxedo Mask in the Santa outfit. The SS movie was kind of a mess imho, I hope to see an article about it eventually. The wacky enemies and setting fit the tone of the season I guess. I agree with the director’s perspective about the stock footage for transformations and attacks. However, the audience gets plenty of it during the regular series, there isn’t a shortage of it! The movies are special and it was a great idea to make the attacks look and feel special like they did in the R movie. Using the standard attack footage just makes it feel less special, like it’s just another TV episode instead of a movie. The S Movie would have also been the perfect opportunity to add the third story arc attacks that didn’t make it into the anime (aka Coconut Cyclone, Chrono Typhoon, etc). Yeah, that was part of the reason. The other part was probably “Ikuhara lost his job because he used twenty thousand drawings and a super expensive CGI scene on the movie, I’m being thrifty”.